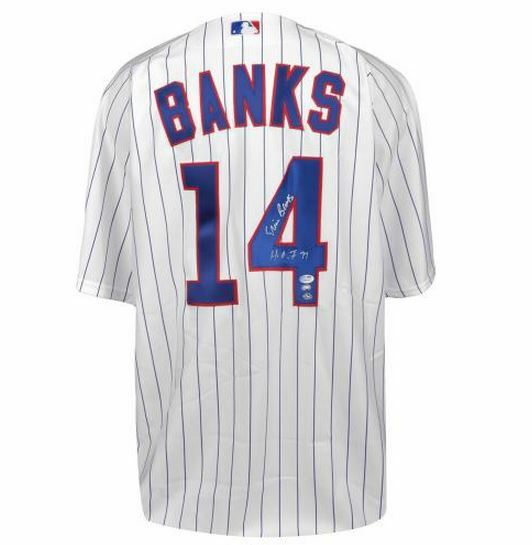 For years, Ernie Banks was the heart and soul of the Chicago Cubs. Adored by fans, "Mr. Cub" remains an ambassador for the team. Ernie Banks cards and autographed memorabilia hold a special place in the collections of his numerous fans still today. Banks' accomplishments led to his Hall of Fame induction in 1977. He is a member of the 500 Home Run Club. 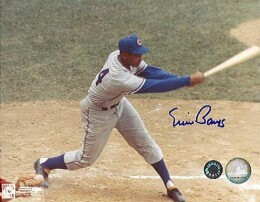 Banks was also a 14-time All-Star and won the National League's Most Valuable Player Award twice. 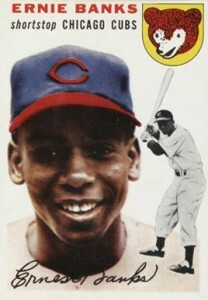 Ernie Banks' rookie card can be found in 1954 Topps Baseball. He also has a photo card in the 1954 All-Star Photo Pack. His early autographed cards include 1992 Front Row and 1993 Nabisco All-Stars. His first certified autograph card produced by a major trading card manufacturer is from 1997 Donruss Signature Series Baseball, which is serial numbered to 2,000. He also has a Notable Nicknames parallel that is numbered to 200. In 1999, Upper Deck produced Ernie Banks' first memorabilia card. The card is part of the Piece of History set and commemorates him being a member of the 500 Home Run Club. It contains a piece of game-used bat. The card is not serial numbered but has a known print run of 350 copies. In addition, an autographed version of the card also exists. 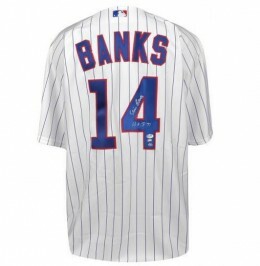 It is serial numbered to just 14 copies, which happens to be his jersey number. 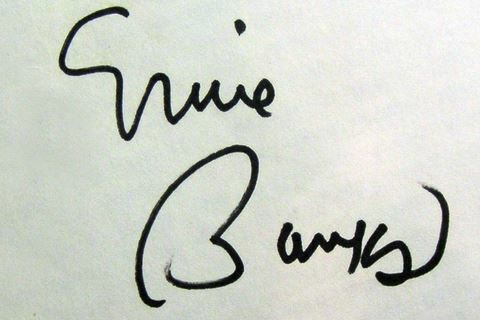 Ernie Banks has always been a gracious in-person signer. He also regularly participates in organized signing events. The values of his memorabilia have remained consistent through the years. Demand is constant as new generations of Cubs fans come to appreciate his infectious personality and Hall of Fame credentials. The 1954 Topps Baseball set is a favorite with vintage collectors. It is truly an iconic set in the hobby. Banks shares the rookie card spotlight with fellow Hall of Famers Hank Aaron and Al Kaline. So desired is this card that even low-grade examples often command hundreds of dollars. 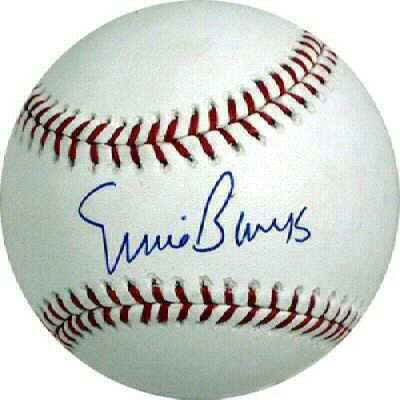 Below you will find an example of what Ernie Banks' authentic signature looks like. This can be used as a first point of reference for determining the legitimacy of autograph memorabilia, but is not a substitute for having your items authenticated by a well-respected professional autograph authentication company. Some of the trusted sources within the sports memorabilia market include the following companies: PSA, JSA, Steiner, Mounted Memories and Tristar. Click on any of the images below to view full size photos. It is a fairly easy autograph to discern by letter. The "E" resembles a backwards "?" The ""r" is drawn as an up and down stroke with a plateau at the top. The "n" resembles more of an "m."
The "i" is always dotted. The "e" is usually formed with an open loop. The "B" is open and makes a bit of a kidney bean shape as the humps of the letter are very shallow. The "a" is usually open. The "n" resembles the one in the first name. The "k" consists of a vertical line, an angled line that does not always touch the vertical. The second angled line is used to flow into the "s," which is open at the bottom.